Create your own coasters inspired by Kate Spade's trendy gold dot coasters to add some glamour to your coffee table. 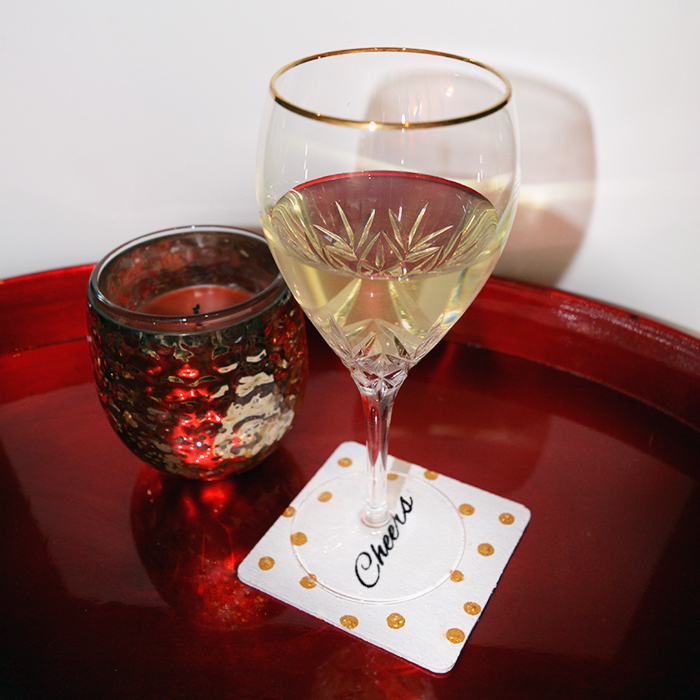 To create your own coasters you will need to pick up white, gold and black paint along with a set of cork coasters that can be found at dollar or craft stores, but it will be a fraction of the cost. You'll be surprised with how easy it is with these simple-to-follow instructions! Begin by painting the front and sides of the coasters with two coasts of white acrylic paint and allow the paint to dry. Flip over the coasters and paint two more coats of paint on the back side of the coasters. Using the end of the paintbrush, pencil, or marker dip the end into gold acrylic paint and stamp the paint down onto the coaster to create a gold dot. 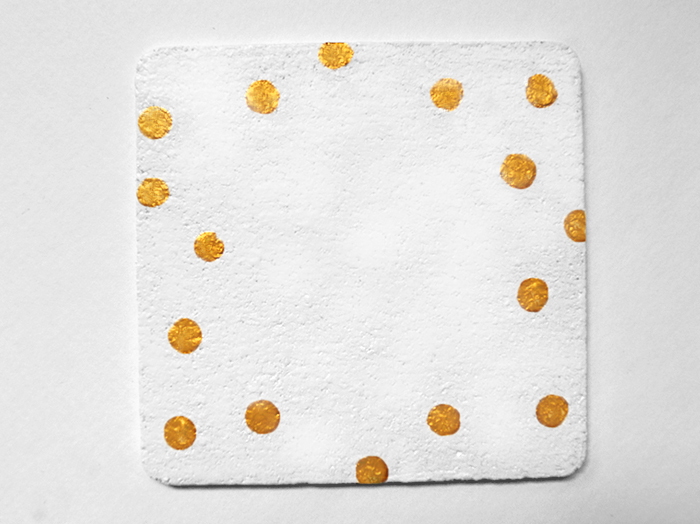 Continue stamping gold dots around the edges of the coaster to create a random pattern. Repeat this process of stamping gold dots on all the coasters. Prior to starting to stamp if you wish you can practice creating gold dots on a piece of paper until you are able to get fairly consistent gold dots. Next in the middle of the coasters use a pencil to write out the word “cheers” and trace over the word using a paint acrylic paint marker. If you are unable to find a black acrylic paint marker you can either skip this step, or using a fine tip paintbrush paint over the letters carefully with a paint brush and black acrylic paint. 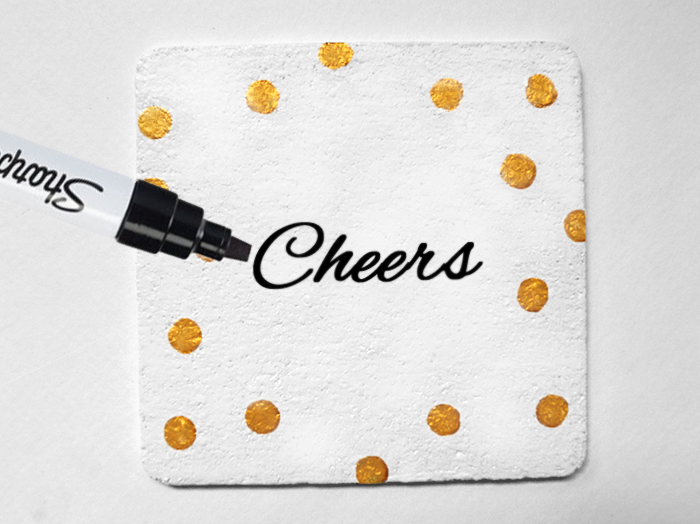 Once again paint the word cheers on all the remaining coasters, or write a different message on each coaster such as “bottoms-up”, “cin cin”, and “proost”. Allow the black paint to completely dry before using, which will take approximately 30 minutes. It's a simple DIY that can make a real difference in your party or home decor and at only a fraction of the cost! What is your favorite wine to pour when you're hosting a party?